Many diabetics assume they should avoid fruit due to its high sugar content, but the American Diabetes Association recommends eating fruits because they're loaded with vitamins, minerals and fiber. Canned fruit is on the American Diabetes Association's list of healthy foods for diabetics, but some types of canned fruit are better than others. Diabetics must control the amount of carbohydrates they eat because carbohydrates raise blood glucose levels. Fruit contains carbohydrates, so you need to count fruit as carbohydrates in your meal plan. Most fruits have a low glycemic index, which is a measurement of how much a particular food raises blood sugar. Because fruit contains fructose, a natural sugar, having fruit as a snack or for dessert is a good way to satisfy your sweet tooth and get beneficial nutrients. Fresh fruit is usually a better choice for diabetics than canned fruit. Canned fruit packed in heavy syrup has added sugar than can raise your glucose levels. The best kinds of fruit are fresh, frozen or canned without added sugars. Some canned fruits are packed in their own juice or in water. Unlike fruit juice, such as orange juice, canned fruit and fresh fruit have plenty of fiber. A fiber-rich diet is important for diabetics because fiber slows the speed at which carbohydrates enter your bloodstream, helping to prevent spikes in your blood sugar, according to Elisa Zied, R.D., author of "Nutrition at Your Fingertips." Fiber in the diet is also associated with a healthy weight, which can help manage diabetes. The American Diabetes Association recommends eating only canned fruits packed in their own juices, water or light syrup. 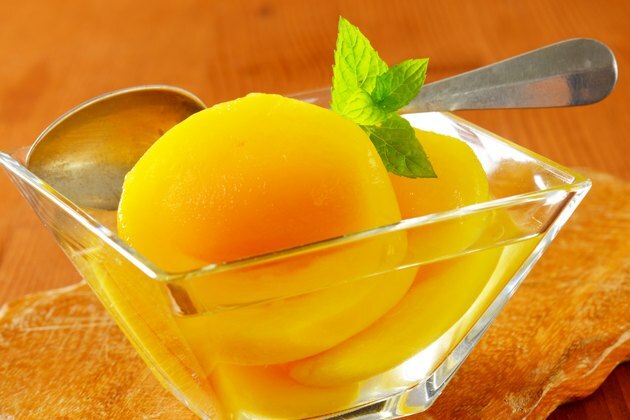 Avoid canned fruits in heavy syrup. The cost of canned fruit packed in water is usually the same as canned fruit packed in syrup, Zied notes. Don't simply rinse the syrup off fruit packed in heavy syrup. Ask the Dietitian notes canned fruit absorbs the sugar from syrup, so attempting to remove the syrup by rinsing is not usually effective. A 1/2 cup of canned fruit without added sugar has about 15 g of carbohydrates, which is the same as the amount of carbohydrates in a small piece of whole fresh fruit. Drain canned fruit packed in juice or water for a parfait dessert. Add half a cup to low-fat yogurt for a nutritious treat. Zied suggests using pears, apricots, peaches, berries and apples because they're particularly high in fiber. Check the ingredients list on the label before buying canned fruit. Steer clear of cans with high- fructose corn syrup, corn syrup solids, sorghum or inverted sugar listed among the first ingredients. These ingredients mean the canned fruit has lots of added sugar. Zied notes buying diabetic canned fruits is a safe choice because they're typically packed in water.